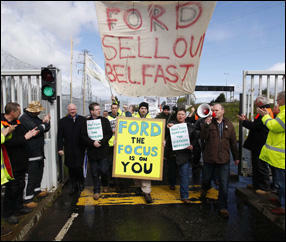 Ford/Visteon Belfast workers today (Sunday 3rd May) voted 147 to 34 to accept the deal already accepted on Friday by Enfield and Basildon Ford/Visteon workers. But workers have pledged that the occupation in Belfast, and 24hr pickets in Enfield and Basildon, will continue until the deal is signed, sealed and delivered to their satisfaction. Certain details of the settlement remain to be clarified.